The summer garden is finally in full swing. 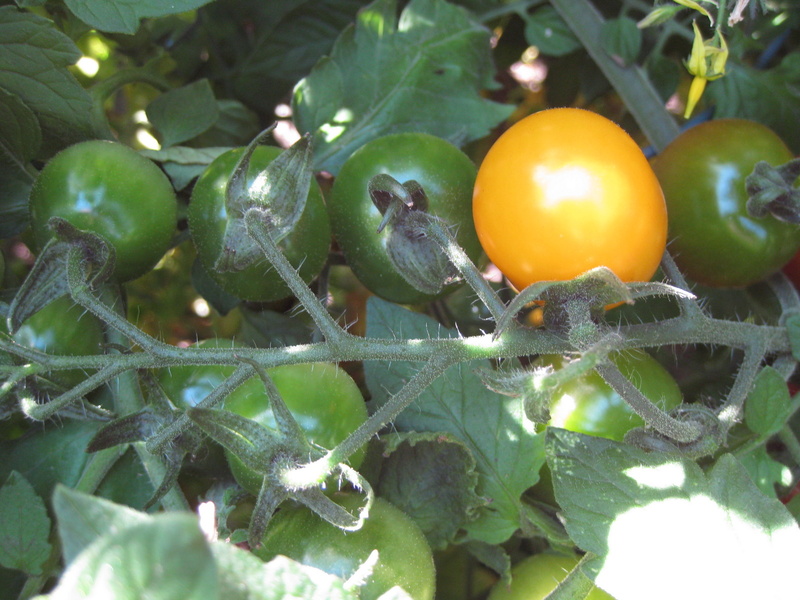 We have ripe tomatoes! We have cucumbers! Fall beets and broccoli have been planted! 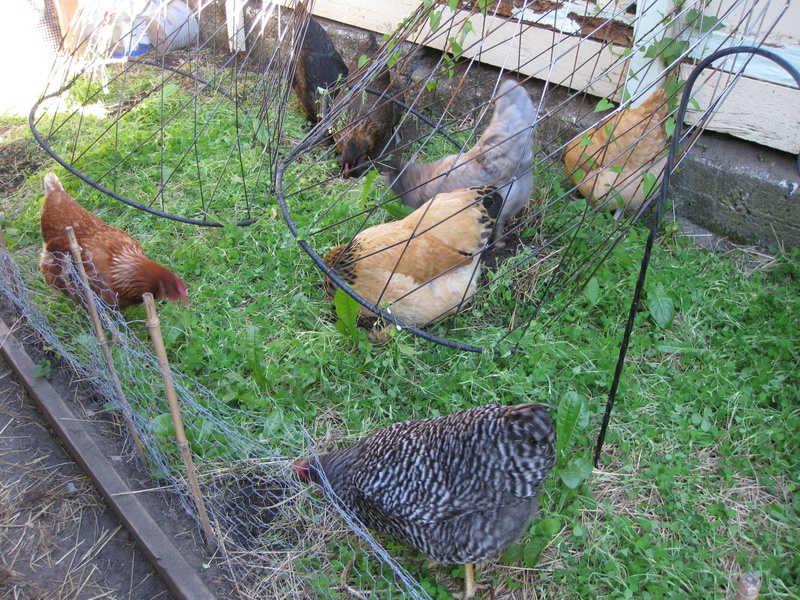 The chickens enjoy the first day grazing on their clover patch. 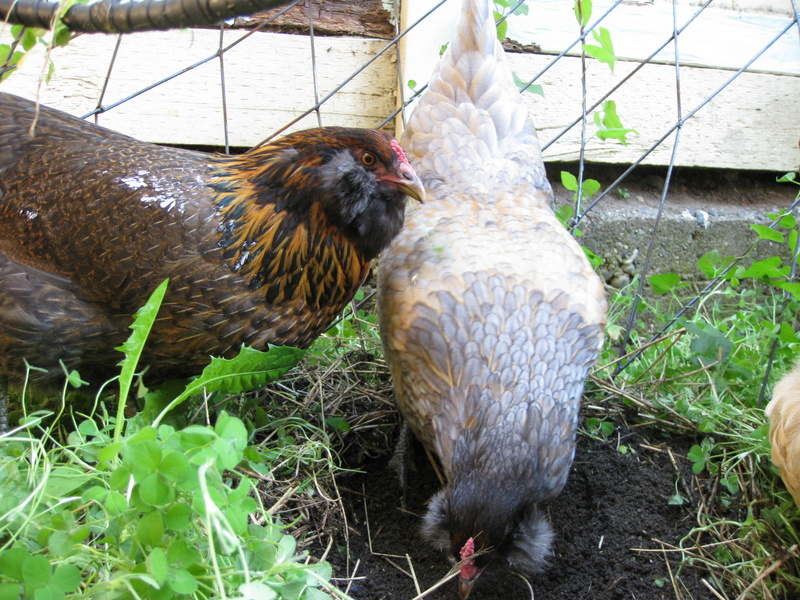 The Americauna sisters Mabel and Ferdie dig for worms. Amelia demonstrates how quickly she can scratch for grubs. 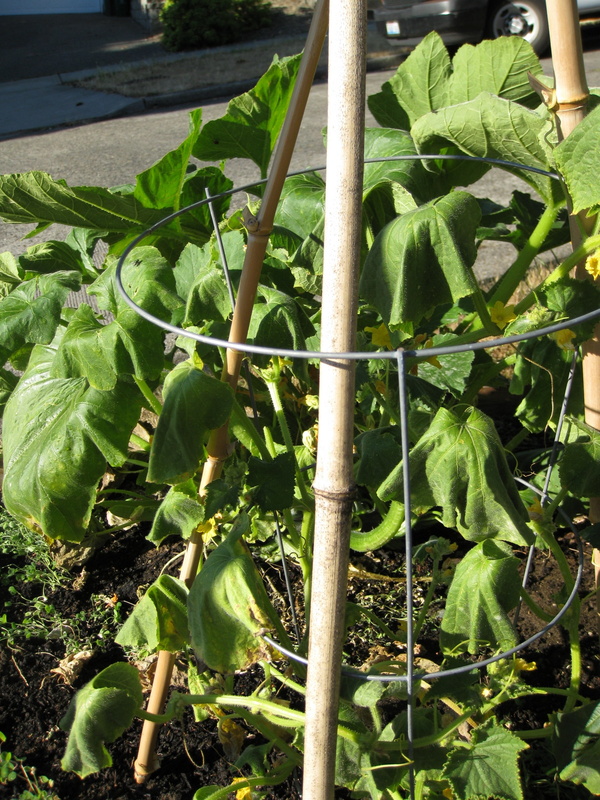 The cucumber vines seem not to appreciate warm dry weather as much as Seattleites. 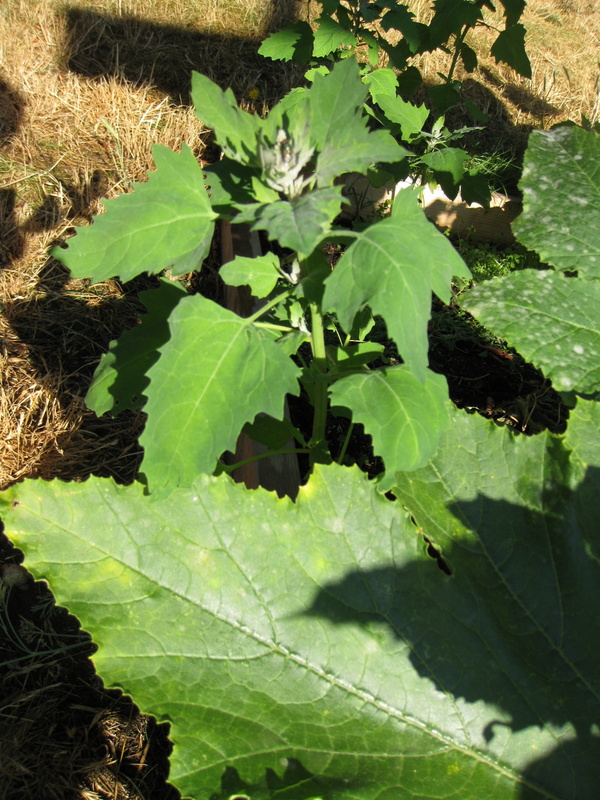 We have six quinoa plants living with the squash. I have no idea how they will turn out. 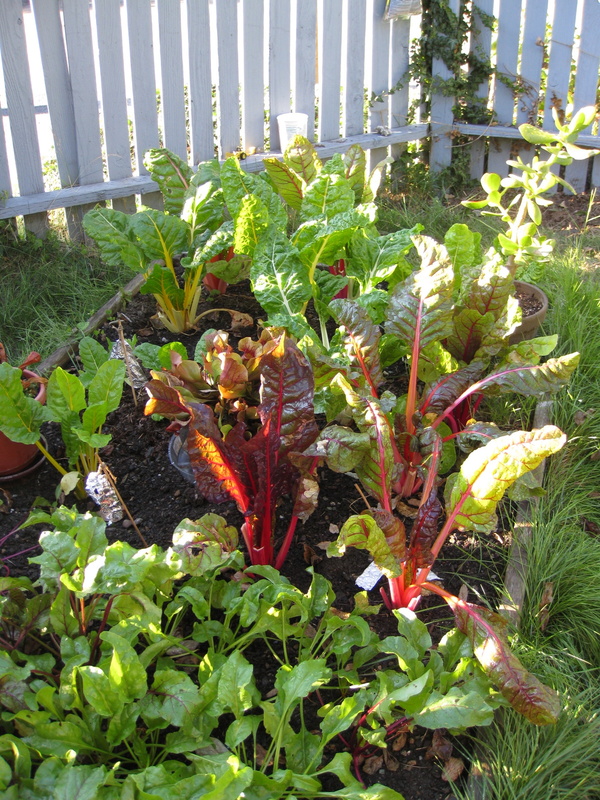 Chard going strong. Beets finally getting to be a size worth eating. 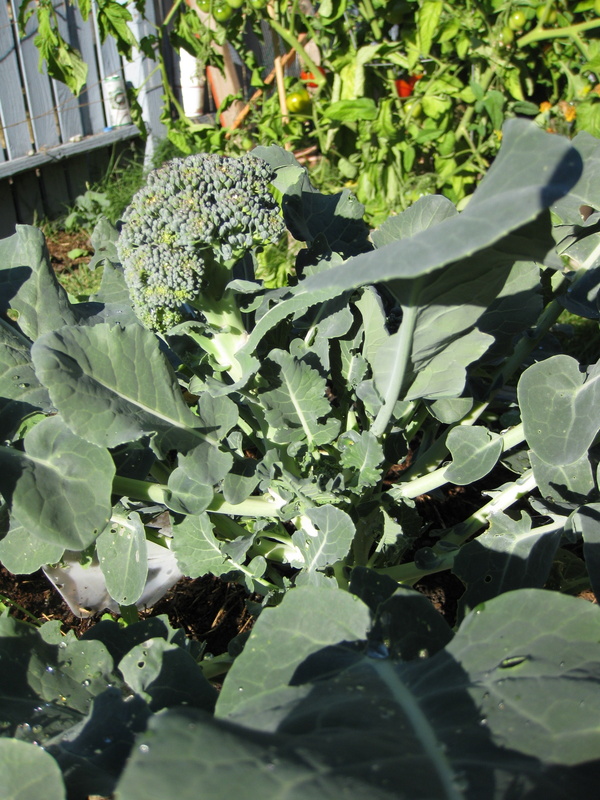 The last hold out of the spring broccoli crop. Is it cabbage? Or is it green swiss cheese? 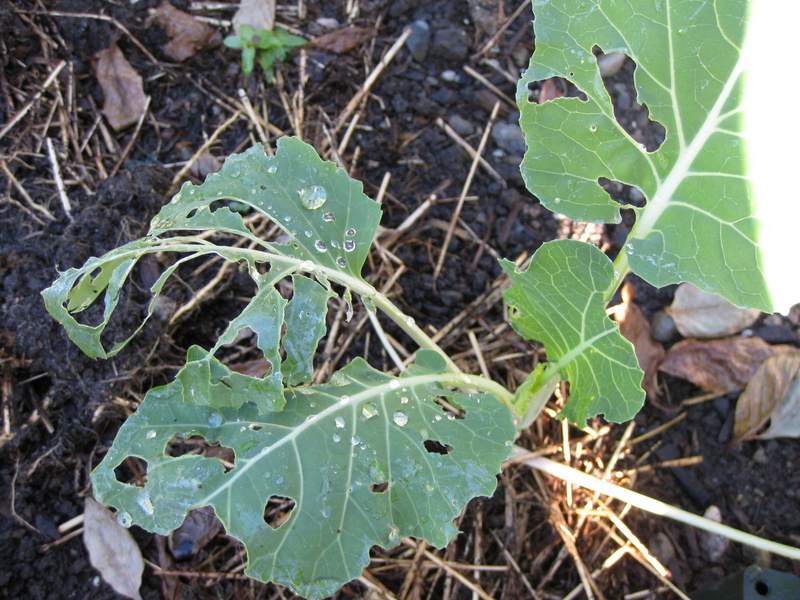 A new broccoli transplant taking one for the team. Finally- a color other than green! 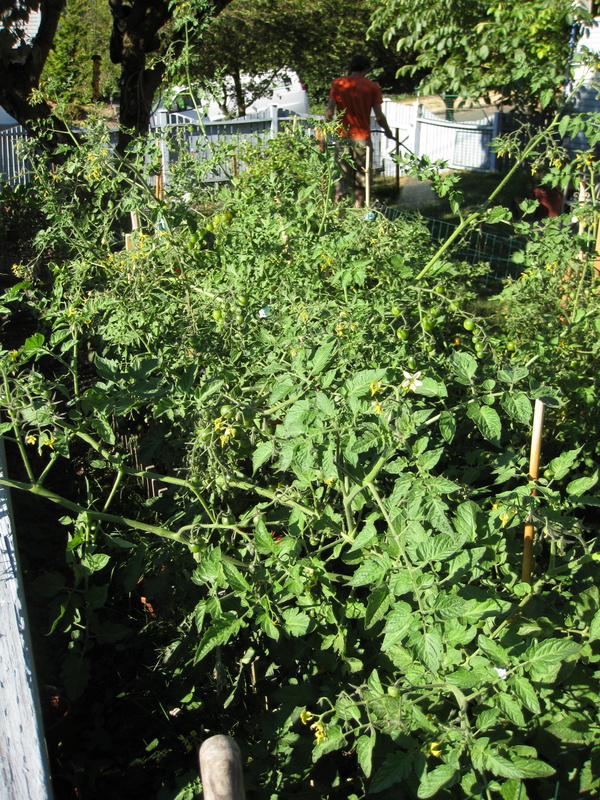 The tomato jungle. I definitely planted these too close together. 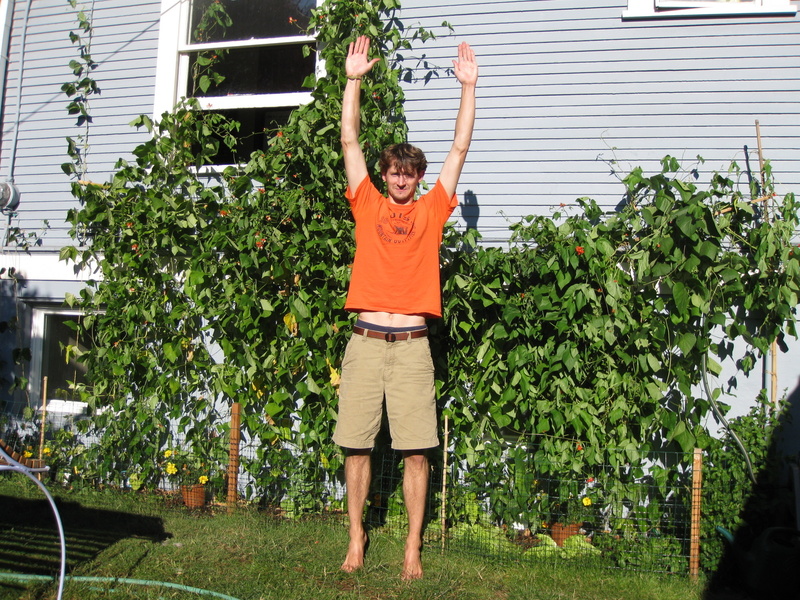 David provides scale for the runner bean vines, which were growing higher until their bamboo support collapsed under their weight. 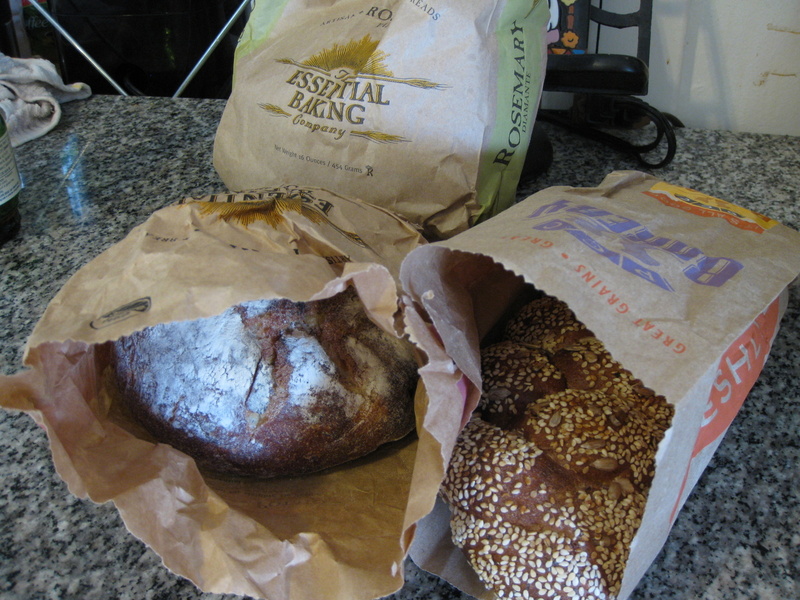 Dave brings us dumpster-dived bread for us and the chickens. 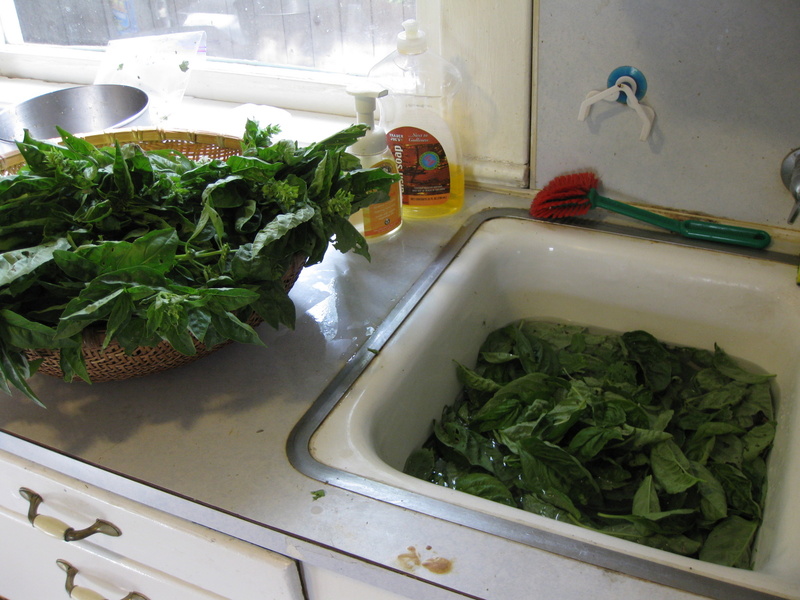 Washing the basil harvest, which will then be blended with olive oil and frozen in ice cube trays. 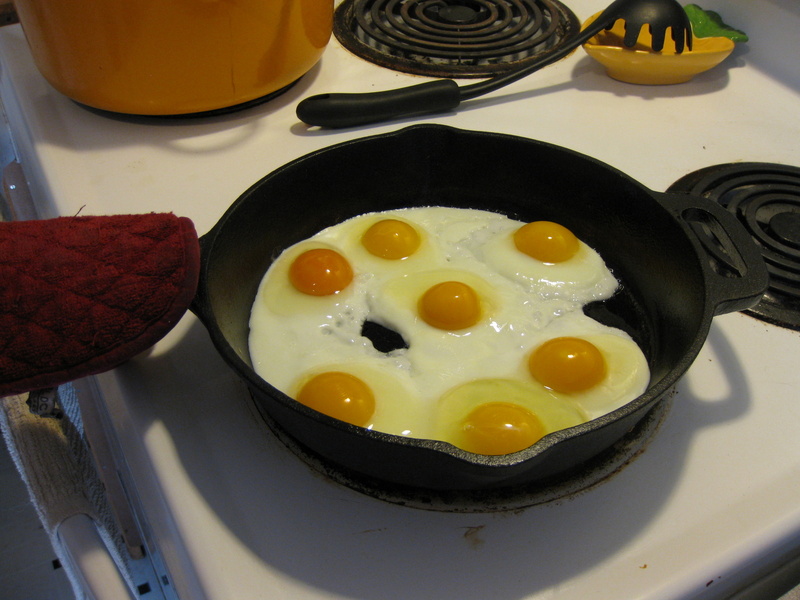 All seven chickens are laying now! Compost is exciting. 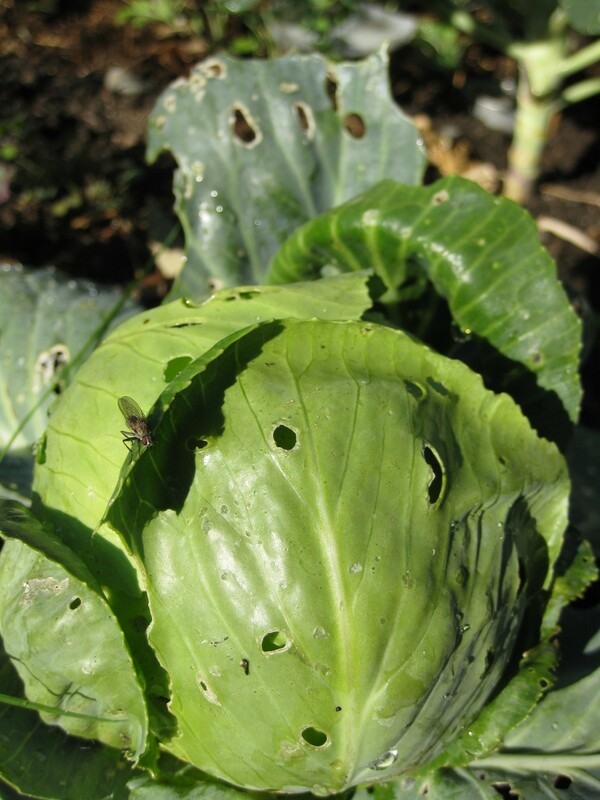 The act of composting takes care of food scraps and yard waste so they don’t end up in the land fill. 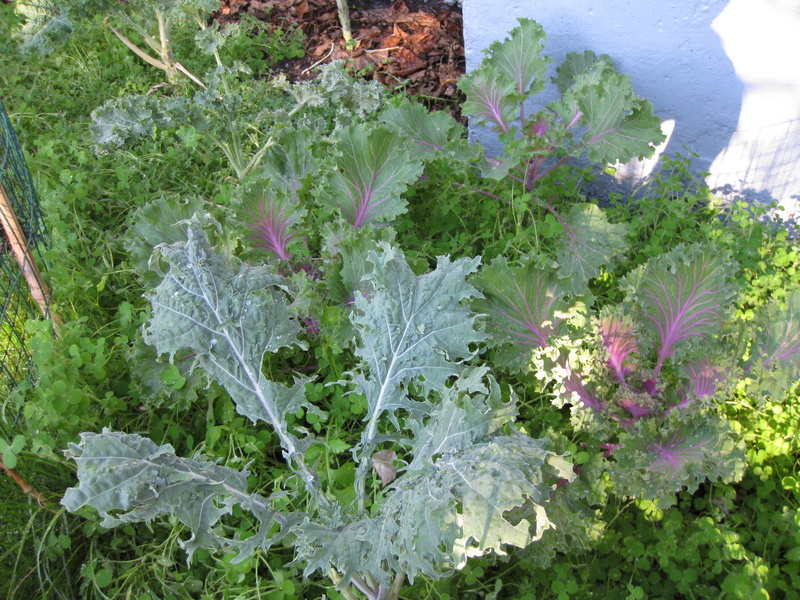 And using compost in the garden delivers much needed organic matter and nutrients to the soil. 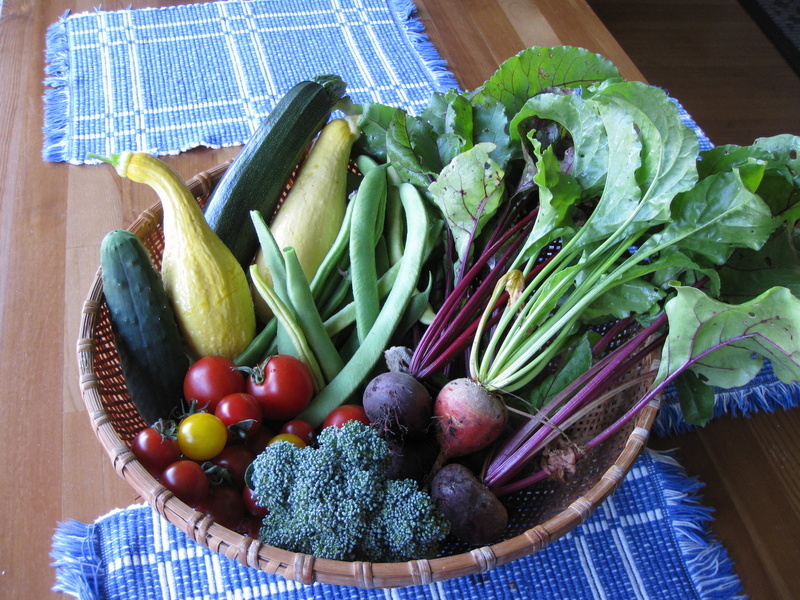 Composting closes the loop, bringing your garden, be it containers on the patio and a worm bin or a full blown hobby farm, closer to sustainability. Kitchen scraps get sorted into bins 1) for the chickens 2) for the worms 3) for non-edible food waste (bones, pits, citrus rinds) taken to Cedar Grove composting. 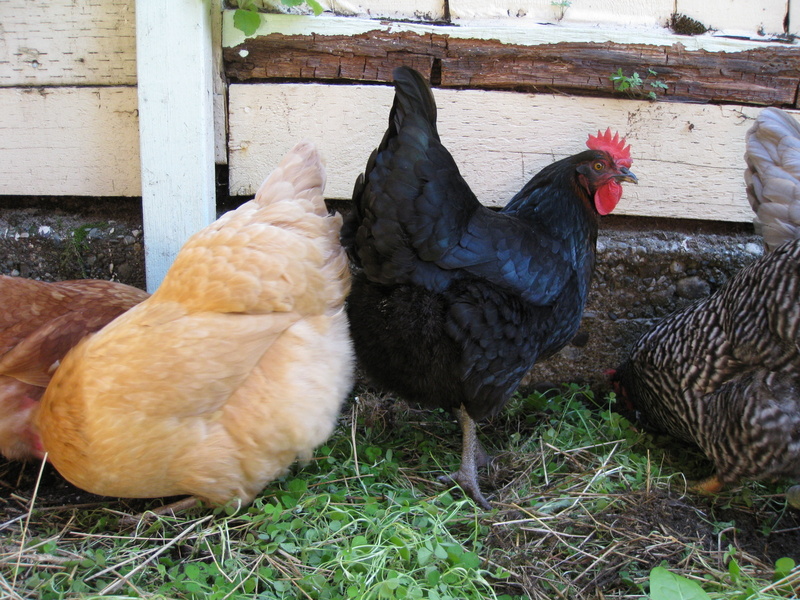 For our yard waste, cut grass and fallen leaves go into the chicken coop as bedding that will get scratched apart and pooped on. Weeds like morning glory (the bane of my existence- it cannot be killed!!!) and shotweed go into the yard waste bin so that they don’t end up sprouting in the garden. 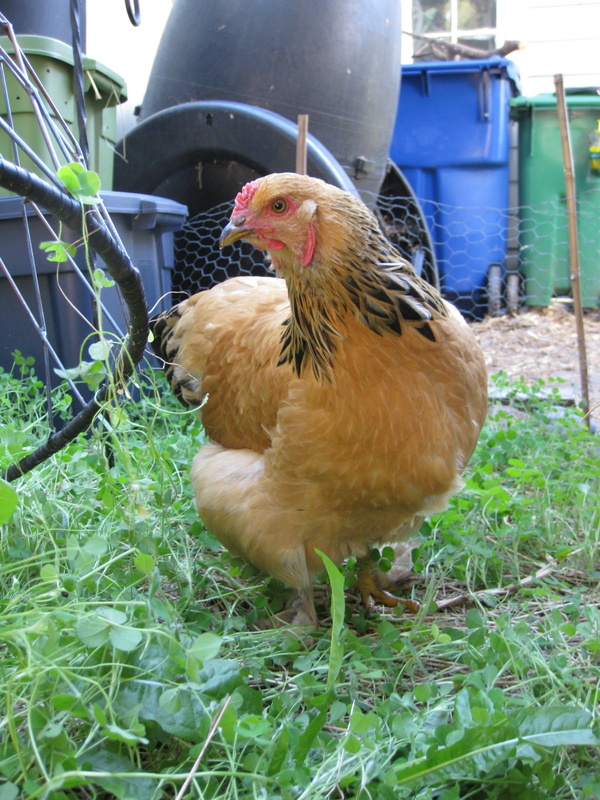 The chicken bedding (w/ torn up leaves, grass, veggie scraps, and chicken poop) gets put into a compost tumbler every couple months. 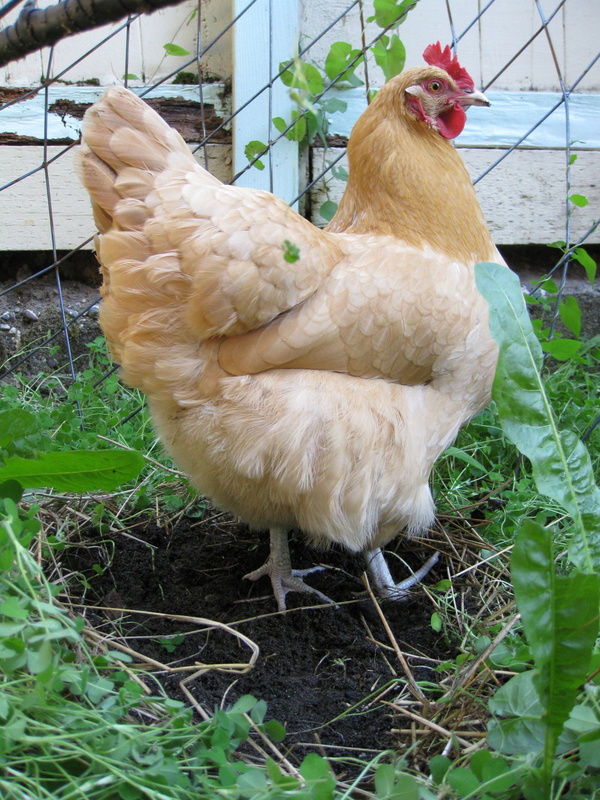 The nitrogen rich chicken manure heats up the material and helps it compost really quickly (so does the black barrel). We spin the barrel on most days to aerate it, which helps the material decompose aerobically, instead of anaerobically (a process that produces methane gas, which is 30 times more powerful than CO2 as a greenhouse gas… which is why we don’t want this stuff buried in a landfill). 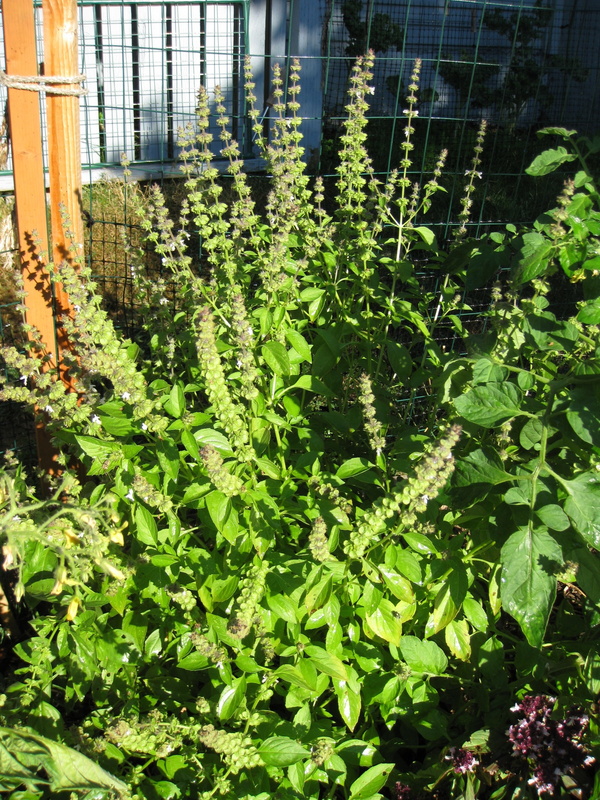 When that’s done, it gets put directly onto the garden beds. 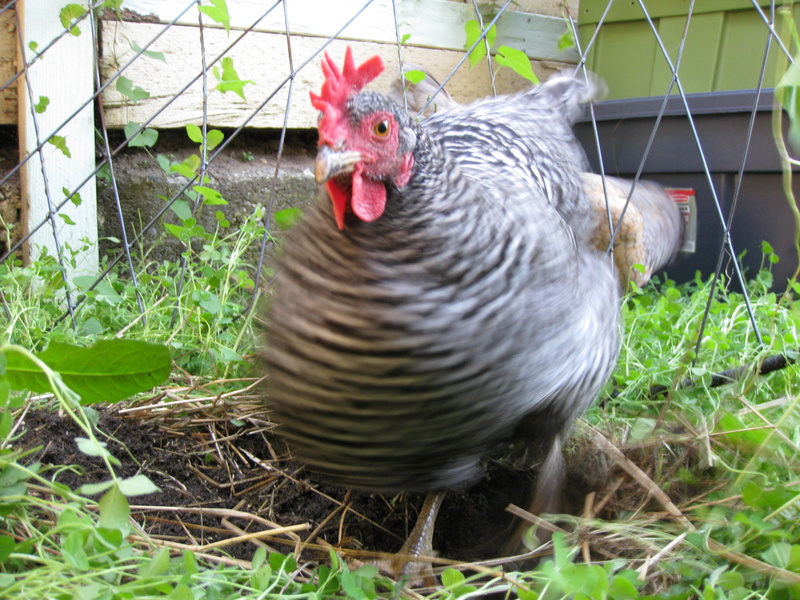 One potential problem with this is that we use pine shavings for bedding inside the coop, which can take a while to break down, and if put into the garden unfinished, actually take nitrogen from the soil to help them decompose. This may be compensated by the super high nitrogen content of the chicken poop. But once our bag of pine shavings is used up, we’re switching to timothy hay, which breaks down more quickly. We use it as the bedding in the run, and it works pretty well- by the time we rake it out of the run to put in the tumbler, it’s 1/3 broken down already. Worm bin. We have a food scraps worm bin, and a dog poo worm bin. Vermicompost from the food scrap bin goes into the garden when it’s finished, and the dog poo vermicompost will be used on our non-edible plants- an assortment of woefully neglected flowers and shrubs in the front yard. Why a dog poo worm bin? Never would have ventured in that direction, except that Inka loves to clean up after our chickens. (Maybe that’s why she doesn’t hunt them- they have developed a symbiotic relationship; they provide her with delicious snacks, she protects them from would be predators, which, so far, just include the cat and friends’ dogs that come over. We’re hoping she’d protect them from raccoons as well.) Anyway, Inka is stealing the lawn fertilizer that the chickens provide, so i decided to reclaim it (and reduce dog waste going to the landfill) with a dog poo worm bin. However, now that’s it’s been a few months since we got the chickens, the delightful novelty of chicken poop seems to have worn off, and Inka does not eat as much. So…. we might not continue with this bin, unless it makes such fantastic compost that we can’t not continue. We are saving more organic matter from going to the landfill… but it’s still gross. With all of these avenues of composting, you’d think we’d be a streamlined operation here, but the compost doesn’t seem to come fast enough. Half of our garden beds are in dire need of an infusion of organic matter, and by the time we have a few batches finished to feed them, the other half will be at that point. We also don’t have a good sunny location to put our compost tumbler; the sun’s heat would make it go more quickly. So we end up putting partially finished compost on the garden beds. 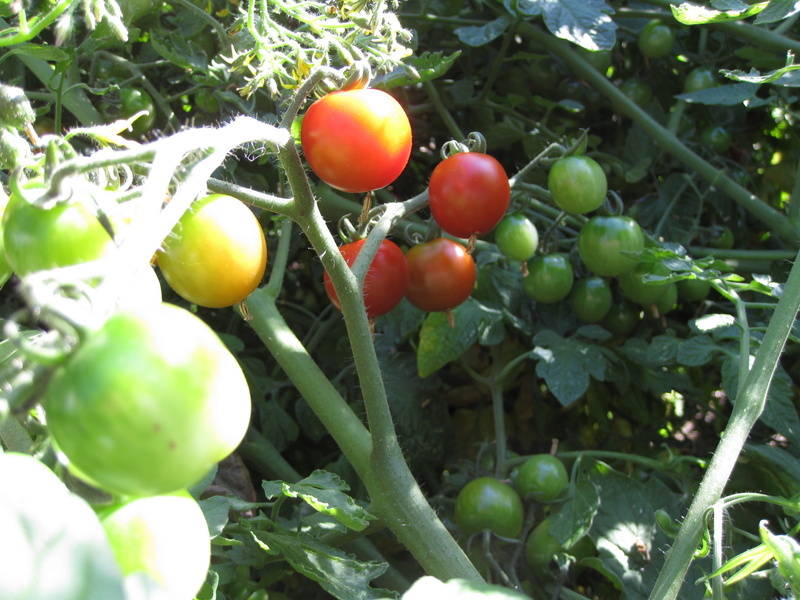 This releases readily available nutrients to the veggies, but finished compost contains nutrients in forms that are slower to break down and therefore are released to the plants over time- good for long term feeding and to avoid nutrient leaching. We also never seem to have enough room or containers for all of the material we want to compost. We’ve got four people total living in our house and producing food waste. David and i have built worm bins one after another to hold everything coming out of our kitchen- we’ll soon be at number four- and the worms don’t seem to be munching quite fast enough. 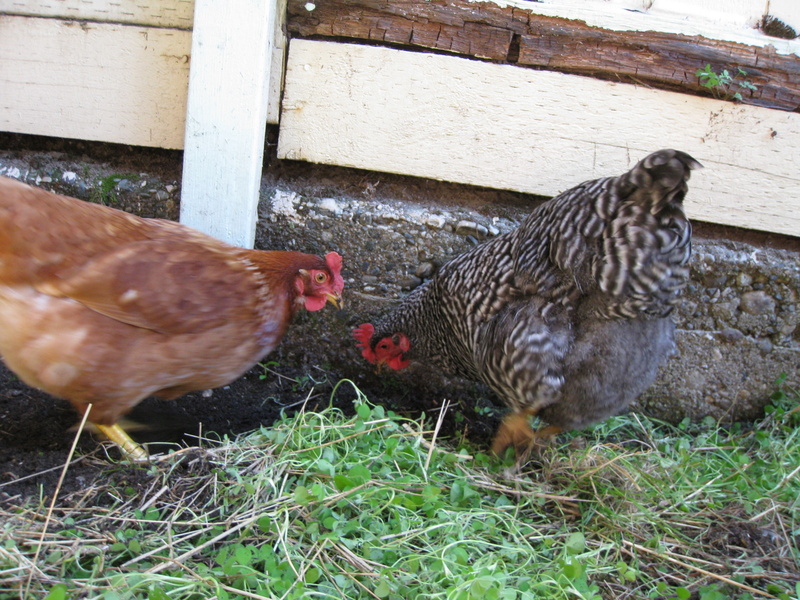 Now that the chickens are full grown, they should be able to help us out with a good portion of the food scraps. Someday we’ll find a balance… perhaps when we move to a place with a bigger yard with space for a real compost pile or another couple of tumblers… and more chickens… and a couple goats.